HO is one of the most popular modeling scales worldwide. Large enough to appreciate fine detail but small enough to fit in most spaces, you can find a vast selection of products to finish your layout. With a little calculation, these plans can be adapted to other scales, as well. The designation "HO" stands for "Half O." It is one-half of O-scale trains. In the model train world, systems are classified as letters. HO scale trains are 1:87 real-life scale. These plans can provide the inspiration to get you started. Once you have your plans, look into tips for building your platform and so much more. Get ready to embark on a hobby that can last a lifetime. This simple 4x8 foot trackplan is the starting point for a new project layout. This design offers big scenery to compliment the small narrow-gauge trains. Denver and Rio Grande trains are HO scale but are narrow gauge—this is a different twist on HO railroading. Take a look at how to build these layouts from start to finish. Classified as HOn3 gauge, these trains are modeled on narrow gauge train lines (the rails are closer together). This means that although HO and HOn3 cars and locomotives are the same sizes, the trucks (wheels) and rails (tracks) are different between the gauges so their model railroad tracks are not interchangeable. The "n3" in HOn3 stands for "narrow gauge, 3 feet." Normal standard gauge in the United States, Canada, and Mexico is 4 feet, 8.5 inches between the rails. Any railroad with rails closer together is referred to as narrow gauge. These trains were popular in mining and lumber railroads like the southern Rio Grande region, Denver, and the Pacific, these train lines were 3-feet narrow gauge lines. Adding a few switches and track sections to a starter set oval can greatly increase operating interest. Add a few switches and operations to the oval of track which came with your first train set. This will increase the time it takes to complete the loop as your train stops to work the industries along the way. Think about how to add industries and scenery of your choice to give this simple plan a character all your own. Combining two common track plans yields a layout greater than the sum of its parts. Learn how to make figure-eights. Combine two common starter layout designs in this plan. Run two trains at once or switch back and forth between different routes. The "Paper and Pines" railroad features a dual personality of forested mountains and heavy industry separated by a high ridge, tunnel and rock cut. 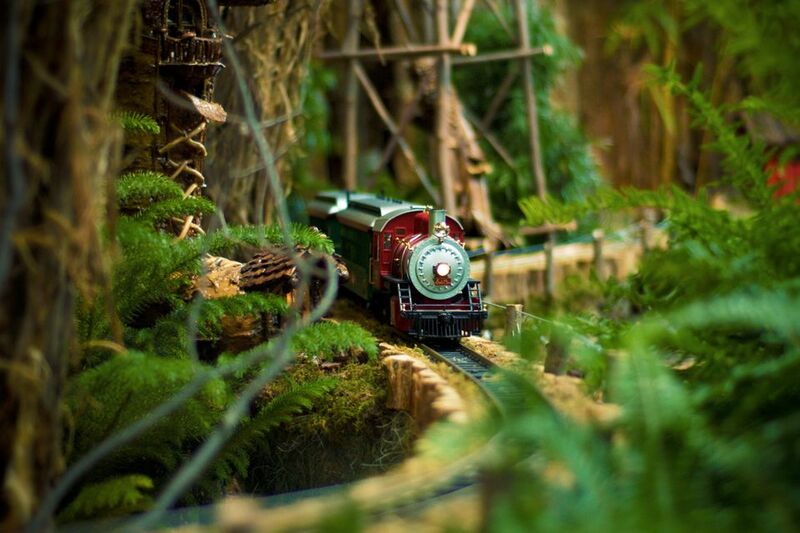 Spectacular scenery on one side, heavy industry and switching action on the other, this 4-foot x 8-foot layout combines the best of several aspects of model railroading like mining or lumber activity and realistic-looking pine tree forests. The tracks around Factorytown will keep your HO locomotive busy. This 4-foot x 8-foot layout offers a nice blend of industrial switching and urban scenery with a track selection that may be an easy expansion from your starter set. The "City of Industry" lives up to its name with ample opertunities to put your switcher to work. This plan combines continuous running with lots of switching to keep your train busy for hours as you drop off and pick up freight from the customers along the line. This is a great layout plan if you get tired of watching a train run in circles. Learn more to see what operations are all about. The over-under route doubles the length of the run. The grade connecting the two levels is shown on both plans. Adding a grade and folding a loop of track back on itself doubles the length of the run on this plan. Hiding portions of the line in tunnels or behind view blocks can make it seem even longer and more interesting. You can use staging track and add room for more industries in order to extend this route. Starting with sectional track from a typical train set, add some switches and turn the circle inside-out to create a challenging switching layout with room for scenery. For a truly challenging switching session, give this track plan a try. Turn your oval inside out and stop running in circles. Model the end of the line instead. Set out and pick up freight, turn the engine, and prepare for the next run. Tight curves and limited clearances add to the challenge and force you to plan your moves carefully. There is room for scenery around town too. The South Street Industrial track features several industries and street running for interesting operations. Paved areas are shown in gray, buildings in brown. This linear layout keeps the action close to the operator. This design makes it easy to switch the industries and enhance the layout with detailed urban and industrial scenery. This HO layout features two loops for continuous running and a turntable with lots of room to display locomotives. Many modelers end up with more locomotives than they could ever run at once. Show off your trains with a HO showcase track plan that uses two outer loops for running with a turntable and tracks to display the rest of the collection. This 10x12 around-the-walls plan connects heavy industry and rugged scenery with a long mainline. A 10-foot x 12-foot mountain pass room-sized layout features mountain scenery, a long mainline run, and several industries. The Cumberland Mines Railroad proves that a layout doesn't have to be complicated to follow a prototype closely. Based on a small prototype, this mining line model plan follows a simple track plan of a isolated coal hauling railroad. Pack a lot of action in a corner of any room with this busy industrial plan. Another simple shelf-style switching layout, you can design this set of tracks over book cases, a desk, or workbench in the corner of any room. This 4x10 switching layout features one large industry with many spots to work. This paper mill layout is a small design in a big industrial setting. It provides lots of modeling and operations options. Set within the confines of a large paper mill, this L-shaped shelf layout uses multiple car types and can keep you busy for hours. It only takes a few cars to fill this small railroad and make operations a fun challenge. Enjoy your railroad anywhere you go. In addition to a simple track plan that provides challenging switching, get step-by-step instructions to build this portable pike. This model plan is perfect for an apartment, college dorm, or as a switching game for kids and adults. This layout proves that good things can come in small packages. The Timesaver switching puzzle will challenge your mind more than your modeling. After more than forty years, this game is still popular. A classic switching puzzle, the Timesaver game has been reproduced in many scales and forms. Combine two back-to-back for even more challenges as you race the clock alone or with head-to-head competition. The "Inglenook" is a simple plan which offers a surprising number of switching options for hours of entertainment. Another classic switching layout puzzle, the Inglenook features just two switches, but there are literally thousands of switching combinations. This layout is truly simple and simply fun.